Their deaths appeared to underscore an increasingly brutal and aggressive shift by pirates in their treatment of hostages. Killing hostages "has now become part of our rules," said a pirate who identified himself as Muse Abdi and referred to last week's sentencing of a pirate to 33 years in prison for the 2009 attack on the U.S. cargo vessel the Maersk Alabama. "From now on, anyone who tries to rescue the hostages in our hands will only collect dead bodies," he said. "It will never ever happen that hostages are rescued and we are hauled to prison." Secretary of State Hillary Rodham Clinton strongly condemned the killings, saying in a statement that the slayings were "deplorable" and underscored the need for international cooperation in fighting the scourge of piracy in waters off the Horn of Africa. Pirates had hijacked the 58-foot yacht Quest south of Oman on Friday. Since then, four U.S. warships and sky-high drones shadowed the vessel's movement as pirates tried to sail it to the Somali shore. U.S. officials negotiated with the captors via radio. On Monday, two pirates had peacefully come aboard the USS Sterett to negotiate with naval forces for the release of the hostages, and remained aboard overnight. But at 8 a.m. East Africa time Tuesday, a rocket-propelled grenade was fired from the Quest at the USS Sterett, a guided-missile destroyer 600 yards away. The RPG missed and almost immediately afterward small arms fire was heard coming from the yacht, said Vice Adm. Mark Fox, commander of the U.S. 5th Fleet in Bahrain. U.S. forces converged on the Quest in small boats and some pirates moved to bow and put up their hands in surrender. A member of a U.S. special operations force killed one of the pirates with a knife, Fox said. A second pirate was also killed, and the bodies of two other pirates were discovered on board, bringing to 19 the total number of pirates involved. The U.S. military didn't say how those two died and it was not known if the pirates had fought among themselves. There were no injuries to U.S. forces or damage to U.S. ships, Fox said. Adam, in his mid-60s, had been an associate producer in Hollywood when he turned in a spiritual direction and enrolled in the seminary a decade ago, said Robert K. Johnston, a professor at Fuller Theological Seminary in Pasadena and a friend of Adam's. "He decided he could take his pension, and he wanted to serve God and humankind," he said. Johnston and Adam worked together to start a film and theology institute. Adam also taught a class on church and media at the school. Since 2004, the Adams lived on their yacht in Marina Del Rey for about half the year and the rest of the year they sailed around the world, often distributing Bibles in remote parts of the Fiji Islands, Alaska, New Zealand, Central America and French Polynesia, Johnston said. 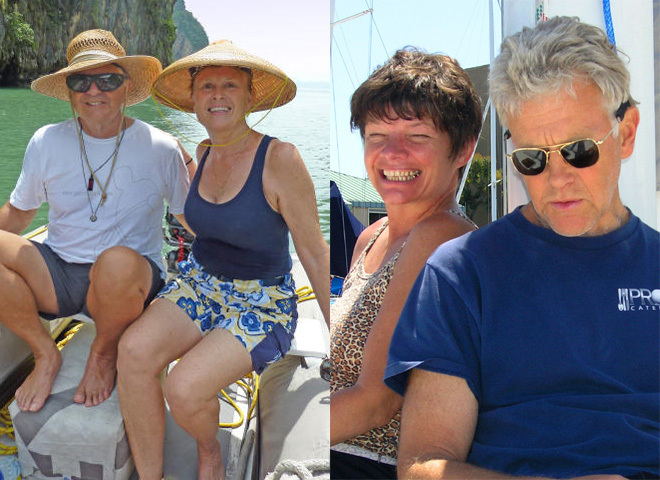 Scott and Jane Adam documented their maritime missionary work on their website, S/V Quest Adventure Log. "Great sailors, good people. They were doing what they wanted to do, but that's small comfort in the face of this," said Joe Grande of the Seattle Singles Yacht Club, where Riggle and Macay were members. But the conventional wisdom in the shipping industry had been that Somali pirates are businessmen looking for a multimillion-dollar ransom payday, not insurgents looking to terrorize people. "We have heard threats against the lives of Americans before but it strikes me as being very, very unusual why they would kill hostages outright," said Graeme Gibbon-Brooks, the head of Dryad Maritime Intelligence, adding that the pirates must realize that killing Americans would invite a military response. President Barack Obama, who was notified about the deaths at 4:42 a.m. Washington time, had authorized the military on Saturday to use force in case of an imminent threat to the hostages, said White House spokesman Jay Carney. Around Christmas the Quest joined the Blue Water Rally, an around-the-world race. But race organizers said the Quest recently left the race despite what Fox said were warnings about the dangers of sailing in Horn of Africa region. The Blue Water Rally said in a statement Tuesday that though yachtsmen are discouraged from sailing in the region, the only other choices are to sail around the stormy and dangerous tip of South Africa or sail back across the Pacific. The Adams were skilled and experienced sailors, having traveled from Panama in 2005 to Fiji in 2007 and Cambodia last year. They most recently sailed from Thailand to Sri Lanka and India, and were on their way to Oman when captured. Johnston said that despite an adventurous spirit, the Adams were meticulous planners who knew the dangers they faced. The couple had sailed with a large flotilla to stay safe from pirates near Thailand earlier in the trip. Motivated by million-dollar ransoms, pirates have become increasingly bold in their attacks despite a flotilla of international warships patrolling the waters off East Africa. The last time pirates kidnapped a U.S. citizen  during the 2009 hijacking of the Maersk Alabama  Navy sharpshooters killed two pirates and rescued the ship's captain. But Tuesday's bloody events are apt to leave U.S. military planners in a quandary: Do they go after the pirates harder? Do they attack their bases on Somalia's ungoverned shores? One maritime expert said it's too early to tell. "This is a first," said Gibbon-Brooks, the analyst. "We don't know if the situation is related to a straight execution. We don't know if it was related to an attempt to break free. We don't know if it was related to an accident." Gibbon-Brooks said the killings were "extremely unwise" by the Somalis, and that the deaths threaten what has been a successful and lucrative business model. Two days before the hijacking, a New York court sentenced a pirate to 33 years in prison for the 2009 attack on the Maersk Alabama, a U.S. cargo vessel. A pirate in Somalia told the AP last week that pirates were more likely to attack Americans because of the sentencing. "It's a black day for us and also the Americans, but they lost bigger than us," a pirate who said his name was Bile Hussein said. "If they still want a solution and safety for their citizens in the oceans, let them release our men they arrested." Only minutes before the military announced that the four Americans had died, a Somali pirate told AP by phone that if the yacht were attacked, "the hostages will be the first to go." Pirates  who currently hold 30 ships and more than 660 hostages  typically win a multimillion ransom for releasing their captives, a huge sum that is shared among investors and pirates. The money is often spent on alcohol, drugs and prostitutes. One ransom paid last year was reported as $9.5 million. Most ransoms are worth several million dollars. Given that typical financial motivation, Tuesday's killings left several unanswered questions, such as whether the pirates, being trailed by the Americans, believed there was no way to avoid spending years in a U.S. prison, or if the American forces spooked the pirates by approaching the yacht, or even if the hostages had tried to retake the yacht from the pirates. Five cars full of pirates were headed toward the pirate dens of Eyl and Gara'ad in anticipation of the Quest reaching land Monday, he said. Had the four reached land, they may have faced a long hostage ordeal like the 388 days that the British sailing couple Paul and Rachel Chandler spent in the hands of pirates. The two were released in November. "This incident is a clear message and alarm that it's time the world community quickly steps up to stop these pirate criminal activities. They should be treated mercilessly," said Gen. Yusuf Ahmed Khayr, the security minister in the northern Somalia region of Puntland, a pirate haven. The Adams ran a Bible ministry and had been distributing Bibles to schools and churches in remote villages in areas including the Fiji Islands, Alaska, New Zealand, Central America and French Polynesia. At the Seattle Singles Yacht Club, friend Hank Curci said Riggle and Macay were carrying out a lifelong dream. "Now that they're gone it's just difficult for us to accept because it's like having a family member killed," he said.